I designed these fingerless mitts after keeping some of Ryan's hand dyed silk. 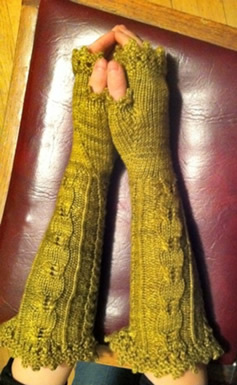 The silk was so pretty and regal looking, it inspired me to design these fingerless mitts. They are ribbed so they will fit many people. 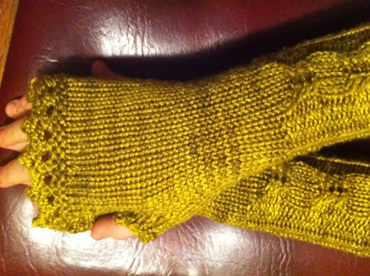 The first fingerless mitt was designed in a day and the second one was knit the second day using the pattern to check for any mistakes in writing. The pattern is named after a piece by pianist Ludovico Einaudi, whose music we have been playing at the shop for the last while. You can knit these up while listening to Primavera. This pattern is available for purchase through Ravelry. Exquisite! Absolutely exquisite!!! Happy New Year!!!! !